Time out, which isn't an official name, is a puzzle based on tricking people using their own expectations. The puzzle is simple: The party is faced with a closed door. 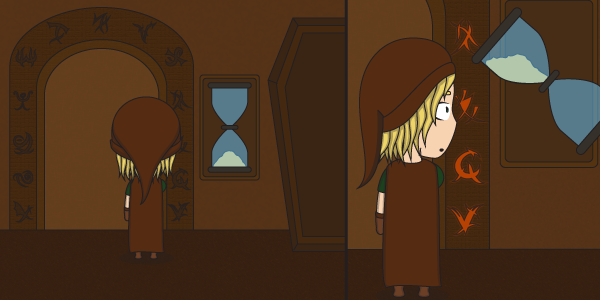 As soon as they try to open it an hourglass will turn around, and thus start counting down. Nothing else happens. Many people will be inclined to stop the hourglass, turning it over again and again to try and prevent it from ever stopping. The trick is to simply let it run. Once it's done (reaches 0) the door will open. This works especially well when playing with people who expect you, as the game master, to throw all sorts of enemies or horrible events at them, as they will expect the timer to signify a terrible event as well. You could add plenty of other misdirections to spice things up, perhaps monsters spawn for as long as the timer is running, perhaps an alarm is sounded, or perhaps the ceiling begins to descend slowly. The ceiling descending element is one of many variations of this puzzle. Instead of a door the party might face a closed room with a descending ceiling. A door'll open once the ceiling reaches a specific height, one that won't kill the party, but the party will likely think it will, and therefore do everything in their power to reset the position of the ceiling. There are all sorts of variations you can play with, but as soon as you've used one of them your players will usually know the trick when you do it again at a different time. Of course you could always change it again for the next time, perhaps that time it actually is dangerous.